Mark’s family is from Michigan, and our travels have taken us there on several occasions, but all by plane rather than RV. During one extended visit in the spring of 2009 we did a circumnavigation of the lower Michigan peninsula with a quick hop over the Macinac bridge so we could run up to Lake Superior and touch our toes in its chilly waters. The charming coastal towns and beautiful lake views made for a delightful trip. Halloween Camping – RV Witches & Goblins at Michigan State Parks! October 26, 2018 Halloween camping at Michigan State Parks has ghosts and skeletons at every RV campsite and kids trick-or-treat at night. Fall Foliage in Michigan’s U.P. + Lake Superior at Sunset October 12, 2018 The fall foliage color in Michigan’s Upper Peninsula & sunsets on Lake Superior are spectacular. 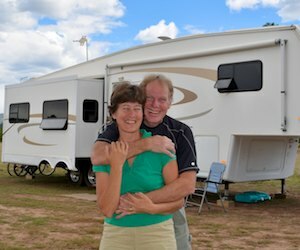 Here are pics from our RV trip! Waterfalls in Michigan’s U.P. – Taquamenon, Bond Falls & Black River Jewels October 5, 2018 On an RV trip in Michigan’s Upper Peninsula we saw Bond Falls, Taquamenon Falls, Gorge, Rainbow and Sandstone Falls – Awesome! South Haven – Harbor Village June 27, 2009 South Haven, Michigan, is a cute harbor village with a long boardwalk where evening sunsets offer cheap entertainment for the whole town. Lake Huron, MI May 19, 2009 June, 2009 – At Lake Huron’s 40 Mile Point Lighthouse we learned the strange story of the wreck of the Joseph S. Fay, and then in Bay City we watched hydroplane races.